The placement of your eBay ads in eBay’s search results depends on a variety of criteria. Listings posted by Top Rated Sellers will show up at the top of the search results. The listings that follow are ranked by their activity or “popularity”, based on the number of page views, bids, and offers received. To generate the most activity on your listings, eBay recommends you utilize the Auction format and follow a simple pricing strategy; Set your starting price low ($100), utilize a Reserve (the price you want for the unit) which cannot be seen by shoppers, and do not use a Buy It Now. This format is proven to produce the most amount of activity, subsequently boosting your listing higher in search! Using this strategy can sometimes result in an overabundance of unique bids due to the low starting price. Auction123 sends a notification with the contact information for the first bid from any bidder on a particular item, not for EVERY bid from that bidder. Many eBay bidders setup proxy bidding, where they set an amount they allow eBay to bid up to on their behalf. Unfortunately, you can never know if the $100 bid received is from a person who has proxy bidding setup to go up to $25,000! This is why Auction123 recommends you contact each and every bid notification we deliver, as there is no indication what this person will be bidding up to. This is also why we urge you to actively observe your listings from within your Auction123 Dashboard so you can see how high the bidding is going. Example: Your listing has 3 unique bidders. You received a bidder notification from Auction123 with the contact information upon receiving each bid for $100, $200, and $300 respectively. Unless you actively observe the bid activity from within the Auction123 Dashboard, you will not know the current bid amount on the listing. 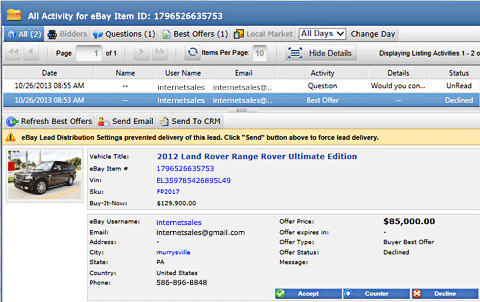 We receive a lot of requests from dealers who want more control over which leads are delivered to their CRM from their eBay listings. As a result, we’ve added new settings that allows you to determine if we deliver leads outside of a set percentage of your Reserve or if we should deliver any auto-declined Best Offers. Navigate to the Preferences menu on the left-hand side of your Dashboard and click Account. Expand the Lead Distribution menu. If you do NOT want to receive the contact information for anyone who placed an Auto Declined Best Offer, check the corresponding box. You will have the opportunity to go into the listing and force send these filtered leads to either your email or CRM. If you only want to receive the contact information for bidders whose bid amount has reached a certain percentage of your Reserve, check the corresponding box and set your percentage. You will have the opportunity to go into the listing and force send these filtered leads to either your email or CRM. Keep in mind that if a shopper has proxy bidding set to a high amount, but the bidding never reaches a price that falls within your distribution criteria, you will not receive that bidder’s contact information unless you manually send the bidder to your email or CRM. Navigate to the listing in your Auction123 Dashboard and from the Listing Details section, click on the number next to your total Unique Bids or Best Offers to view all that were received for that listing. You can also click Show Listing Activity under the Actions for this Listing menu to view all Bids, Offers, or Questions received for the selected listing. Select the lead that you would like to push through and click either Send to Email or Send to CRM. Please contact Auction123 support at Support@Auction123.com or via phone at (888) 514-0123, Option 2 if you have any questions. Visit www.auction123.com to see all of the products and services we offer!